Tickets available now from the Galeri Box Office. The concert celebrates superb and less-often performed works by five English composers:- Imogen Holst, daughter of Gustav Holst, was assistant of Benjamin Britten at Aldeburgh and became joint Artistic Director of the festival, (also working with Osian Ellis). 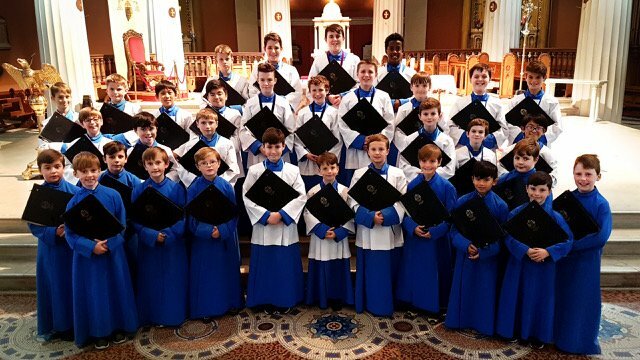 John Rutter as a young chorister took part in the first (1963) recording of Britten’s War Requiem in Coventry Cathedral under the composer’s baton, and Michael Stimpson grew up in London near to where Holst taught at St Paul’s School, and was aware of Holst and his music from a young age. All composers have written brilliantly for choir, though on this occasion, Stimpon’s work is a harp solo in remembrance of the tragic history of Tryweryn. (Note by Sioned Williams). The concert starts on a joyous note with full choir in John Rutter’s Dancing Day , moves to the gentler sounds of Imogen Holst’s Welcome Joy, Welcome Sorrow, ending the first half with the wonderful Rig Veda of Gustav Holst. The reflective and evocative music of Michael Stimpson will surely strike an emotional chord before ending with the superb Ceremony of Carols by Benjamin Britten. The atmosphere and acoustic of the 13th century St Mary’s Church (which is part of the Caernarfon mediaeval town walls) will be the perfect setting for these musical treats. This will be a poignant and brilliant choral concert. Concert duration 90’ including interval.